This cashew cheese is the perfect alternative to dairy cheese. Its creamy texture and aromatic dill taste offers a superior fermented cheese that is also brimming with health properties. 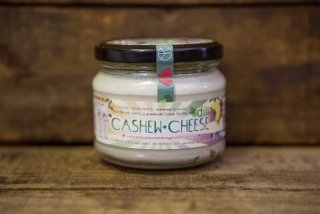 Cashews are a wonderful source of healthy fats and antioxidants and a good source of calcium and magnesium. Cashews can assist heart disease and cardiovascular disease, they can strengthen bones and help nourish connecting nerves and muscles. Cashews contain zero cholesterol, can help cancer cells from multiplying, improve cognitive ability and lower blood sugar levels that helps to prevent free radicals and carcinogens in the body. Call us on 8227 1300 or drop-in to our shop in Gawler Place to order NOW for Christmas Day!